(March 2018) - Community Hospital of San Bernardino Foundation and St. Bernardine Medical Center Foundation are pleased to announce that the San Manuel Band of Mission Indians has provided a grant in support of Dignity Health's commitment to making our community healthy and whole. The grant of $3.2 million will be awarded to both foundations over the next three years and will have a positive impact on the health needs of the community. 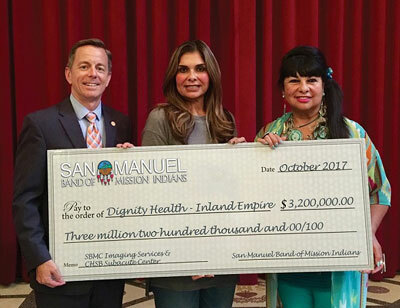 “The San Manuel Band of Mission Indians supports the mission of Dignity Health Community Hospital of San Bernardino and St. Bernardine Medical Center to provide the highest level of care to all who need it without regard for their ability to pay. Our goal for this gift is to provide access to a healing environment to meet the health needs of the San Bernardino region,” says Lynn Valbuena, chairwoman of San Manuel Band of Mission Indians. The funds granted to Community Hospital of San Bernardino Foundation will be help expand its Children’s Sub-Acute Center to include services for young adult patients. The center, which currently serves pediatric patients (age newborn to 21), will add 20 private rooms to serve patients ages 21 to 35. The grant to St. Bernardine Medical Center Foundation will be used to renovate and expand the imaging department. This most recent grant adds to the nearly $3.1 million previously granted over the last 10 years by San Manuel Band of Mission Indians in support of the two hospitals. The longstanding partnership with the tribe has allowed the hospitals to provide quality care to those most in need. More than the purchase of various capital equipment such as patient ventilators, state-of-the-art surgical equipment, and the da Vinci Robotic System, this provides the community with vital health care services.